U.S. Botanic Garden Christmas Display: Washington, D.C.
During the holiday season, the U.S. Botanic Garden presents Season’s Greenings, a unique exhibit featuring model trains and incredible replicas of Washington, D.C.'s most famous buildings and monuments. Each year there is a new theme with additional models. For 2018, the theme is All Aboard! Explore classic railroad attractions like New York City's Grand Central Terminal, St. Louis' Union Station, and more. The exhibit is truly amazing with all of the buildings made of real plant materials. Adults and children will be fascinated by this special Christmas-time treat in the nation's capital. Location: U.S. Botanic Garden, next to the U.S. Capitol at First St., NW. Washington, D.C. Season's Greenings and the Botanic Garden are open 10 a.m to 5 p.m. daily. The Conservatory will be open until 8 p.m. on Tuesdays and Thursdays in December for the holiday season. During these evenings there will be musical performances from 6 to 8 p.m.
See the following photos and get a glimpse of the Botanic Garden Christmas display. At the Botanic Garden's Christmas display, "Season’s Greenings" sycamore leaves were used to create the roof shingles of the Smithsonian Castle. What a spectacular creation? On display are 12 D.C. landmarks including the U.S. Capitol, the Washington Monument, the Lincoln Memorial, with a new addition this year, an inspired botanical version of the National Museum of African American History and Culture. A showcase of more than 30 varieties of poinsettias will feature heirlooms, classics, and multiple newly developed varieties. The "Season’s Greenings" Christmas display at the Botanic Gardens includes a variety of trains, a Santa's Village, a Castle Mountain and much more. In the 2018 model train show, the trains will chug around, below, through, and above plant-based recreations of iconic railroad attractions like New York City's Grand Central Terminal, St. Louis' Union Station, and more. The unique building replicas were constructed by a designer and landscape architect who studied architectural drawings and photographs and created them out of acrylic foam boards adding dried plant materials. The "Season’s Greenings" Christmas display at the U.S. Botanic Garden includes an amazing replica of the U.S. Capitol Building. The National Museum of the American Indian is made of cork and shell fungus. The replica of the Washington Monument is strategically placed across a fountain from the Lincoln Memorial, similar to its real location on the reflecting pool on the Mall. The dome of the replica of the Jefferson Memorial is made from a dried gourd. The Botanic Garden Christmas exhibit is truly amazing with all of the buildings made of real plant materials! If you look inside the Lincoln Memorial, you'll even see a statue of Abraham Lincoln. The U.S. Botanic Garden celebrates the holiday season with a magical display of one of a kind creations. 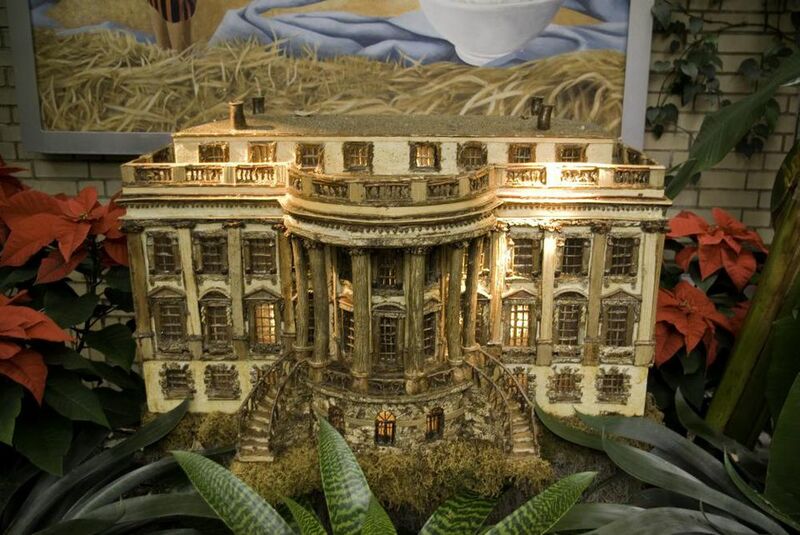 There's even a model of the U.S. Botanic Garden itself!